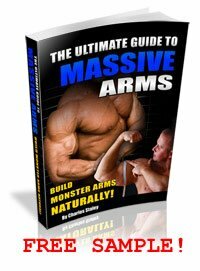 This article on Forearm Exercises was written by our buddy Nick Nilsson from betteru@fitstep.com. Lagging forearm size or grip strength holding you back? Checkout these unique exercises and techniques for developing bone-crushing grip strength and bowling pin forearms! I'll be honest…direct forearm and grip training is something you don't see a whole lot of people doing in the gym. It's not glamorous, it's hard work, it takes time away from more "viewable" bodyparts, and the training it takes to really get results can be downright painful! So that intro didn't send you packing? Good. That means you're serious about building stronger forearms and better grip strength! NOW we can get started. Grip strength is extremely useful in so many ways…the stronger your grip, the heavier the weight you can lift and the longer you can hold it. In the majority of heavy pulling exercises, grip strength is the limiting factor. Building thick, meaty forearms is a great physique enhancement - quite often, the forearms are the only visible muscles that aren't covered up by clothing! I've found that the most effective forearm and grip strength exercises AREN'T the typical wrist curls you see many people doing in the gym. Sure, you can get a good pump and a good burn when doing them but how practical are they when it comes to "real world" gripping? Get a bucket and some playground sand from a home improvement store (it's about 3 or 4 bucks for a bag of 50 lbs so it's really not expensive). Fill the bucket up with sand. Now dive your hand into the bucket and start working your fingers through the sand. A few minutes of this and your forearms and all the small muscles in your hand will be fried! Switch to the other hand and go again. The sand provides excellent all-over resistance for maximizing the effects on the hands, fingers and forearms. If you can't afford a fancy gripper, just get an old tennis ball and squeeze it repeatedly while you're watching TV. Hockey legend Gordie Howe used to do this constantly and he had some of the strongest forearms (and one of the hardest slapshots!) in the NHL. Simple, convenient and effective. No excuses. Set up a barbell in a power rack with the rails set just above your knee level. Load up a bar (use moderate weight to start with). Now stand BESIDE the bar, reach down and grip it in the center with ONE hand. Stand up with the bar and just hold it for as long as you can until your grip gives out. Not only are you fighting directly against gravity, you're also fighting to balance the bar in one hand. Very effective on the forearms and on the grip! Grab a pair of heavy dumbells and go for a walk. Literally. Just pick them up and walk until you can't hold onto the dumbells anymore! Gripping heavy objects while walking creates a lot of instability, which will work the forearms very strongly. And it doesn't have to just be limited to dumbells…there are Farmer's Walk handles that you can buy that work for this. You can also use a couple of EZ Curl bars loaded up and get the benefits of the Farmer's Walk AND the barbell static holds. Heck even walking with a couple of pails of that sand from the first tip is another way to go. Don't limit yourself to conventional items…even a couple of heavy bags of dog food will work! Gripping around a larger diameter is a not-so-secret "secret" that strength competitors often use to develop grip strength. Gripping around a thicker bar puts a very different stress on the grip and forearms, resulting in fast improvements in those areas. You can use bars that are built thick for this (you may have seen "Fat Bars"), or you can use other things to make your own thick bars. Tape is often used to accomplish this (wrapping tape around a bar or dumbell handle repeatedly until it's thicker in size). A technique I like to use is to get some foam pipe insulation from the hardware store, cut off a couple of 5 inch sections then set THOSE on the bar. Grip on those when you're doing you're training and you'll notice a big different in forearm activation (it's dirt-cheap and TEMPORARY, which is nice if you train in a commercial gym which would frown on you wrapping duct tape around their bars). Not reverse wrist curls…actual Reverse Barbell Curls. This will hit the forearms very strongly AND, as you fatigue, your grip will get a great workout because it's the only thing keeping the bar from dropping out of your hands (not the case with regular barbell curls). Secret Training Tip #733 - Reverse Grip Curls - How This Underused, Underrated Exercise Can Unleash Your Arm Size. This is a simple thing but very important. If you constantly use wrist wraps or other grip assistance, you'll never fully develop your own grip strength, which will limit you in the long run. It's fine to use grip assistance once in awhile and for maximum lifts, but the more you rely on them, the less grip strength and forearm development you'll get. Sounds easy enough, right? Grab a chin-up bar and just hang from it until you can't hold on anymore. And I mean until you're hanging by your fingertips and then you slip off the bar because your hands lock up with lactic acid. You'll get a great stretch in your upper body and you'll improve your grip strength at the same time. If you're looking for forearm size and maximum grip strength but wrist curls aren't doing the job, change things up with these techniques. They're easy to implement and VERY effective - no excuses for not getting results!